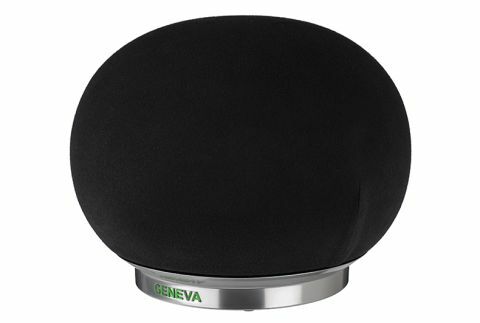 Geneva AeroSphere Small review | What Hi-Fi? It’s small, it’s round, it makes a lovely sound, AeroSphère, AeroSphère. And if Geneva isn’t satisfied with a five-star review that opens with a What Hi-Fi?-penned football chant, then frankly there's no hope. Hold this one close to your face and put its sibling further away: it’s near impossible to tell the difference, as we can say with some authority. It’s only a sense of journalistic pride stopping us from copy-and-pasting the old review, altering a few specs and heading off for an early lunch. The pair are matched in terms of features: you can connect the AeroSphère to your music library via Bluetooth 2.1 with aptX, AirPlay or DLNA, and there’s the option of analogue connection via its 3.5mm jack. If you want to mix and match, the AeroSphère Base (£450), as well as adding radio and a CD player, will allow you to marry up to four of these Geneva speakers to play at the same time. We’re also pleased to find the same classy, tactile remote control in the AeroSphère Small’s box. As you’d expect, there are differences beneath the shell. The AeroSphère Large boasts two 25mm tweeters, two 10cm mid/ bass drivers and an up-firing 12.5cm subwoofer, powered by five Class D digital amplifiers. The Small downscales that armoury to one each of tweeter and mid/ bass driver, powered by a pair of amplifiers. It’s more petite and less powerful but, given this company’s mastery of designing Award-winning wireless speakers, we ought not presume it to be devoid of similar talents. We said about Geneva senior that we wanted to wrap our arms around its bulbous head. And, as we play Grimes’s Art Angels, the AeroSphère Small stretches out to welcome us with those familiar rich tones. The kick on tracks such as California is thick and driving, giving these sundrenched alt-pop gems the impetus to make us move. That has a lot to do with timing; the AeroSphère isn't exactly light-footed, with lots of low end giving the impression of a larger speaker, but it is more than capable of keeping the tempo. Play it next to the Model S Wireless DAB+, another Award winner from Geneva at this price, and not only is there greater girth to the soundstage but it shaves off any hard edges to the treble. It isn’t as clean, perhaps, but for long-term listening we’d opt for the AeroSphère. Take it down a few notches with Andy Hull and Robert McDowell’s mostly acapella soundtrack for Swiss Army Man, and Geneva proves its ability to create speakers that make you want to dance and yet have the nuance to express dynamic soundscapes. The swells wash over us with a combination of wholesome, detailed warmth and delicate expression. It's an impressive performance by a speaker with so many rivals in this area of the market. If you really want to make the most of the AeroSphère family, you’re looking at more than this speaker’s £350 price tag – there's the Base to add radio facilities and a CD player, while a stand will cost an extra £150 for each speaker you add to your arsenal – but there’s no reason you can’t have an entertaining, immersive experience with what's in the box. If we were looking for the best possible multi-room system, we’d be tempted to start with one of these speakers and build from there. Now we just need to copyright that song in case Geneva wants to use it in its AeroSphère adverts.